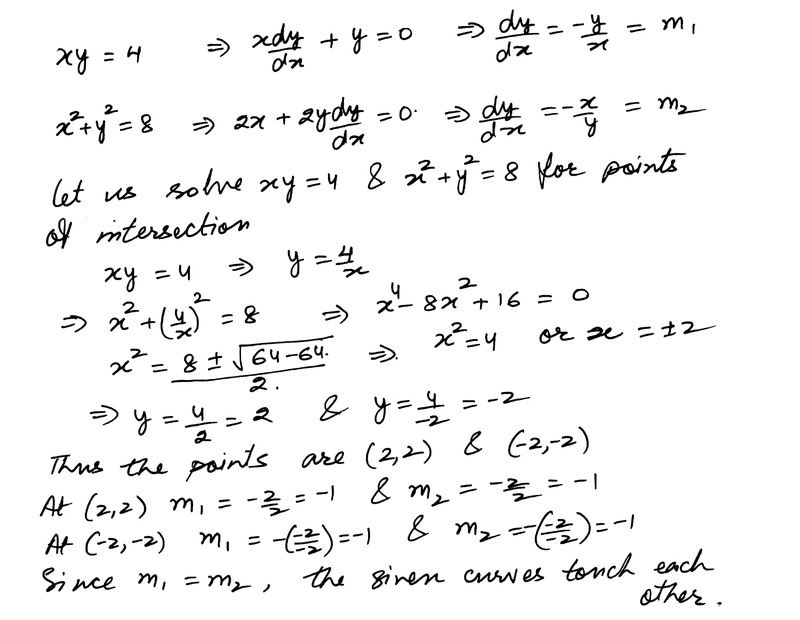 Prove that the curves xy - 4 and x2 + y2 - 8 touch each other. 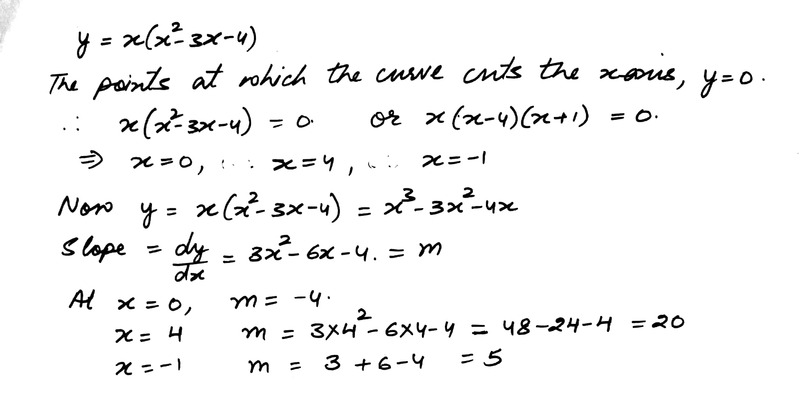 Prove that the curves y = x2 - 3x + 1 and x(y + 3) - 4 intersect at right angles at the poin (2, -1). Find the equations of the tangents to the curve y = x3 + 2x - 4 which are perpendicular to theline x + 14y + 3 = 0. 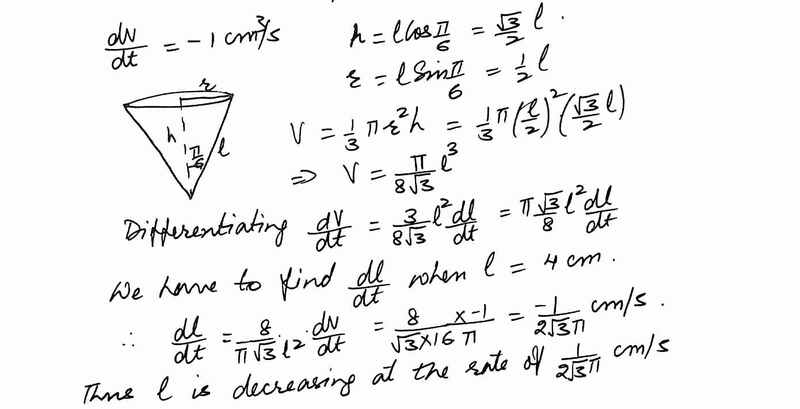 Find the equations of all lines having slope 2 and that are tangents to the curve . 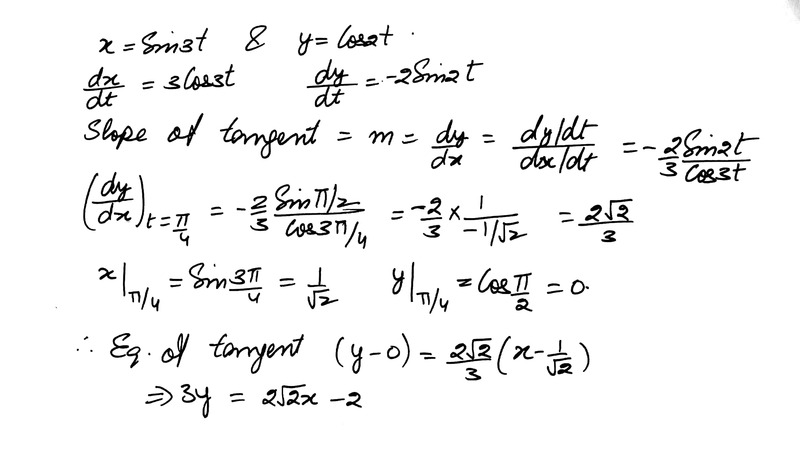 Find the equations of the tangent to the curve x = Sin 3t, y = Cos 2t at . Find the equations of the tangent and the normal to the curve at (1,1). 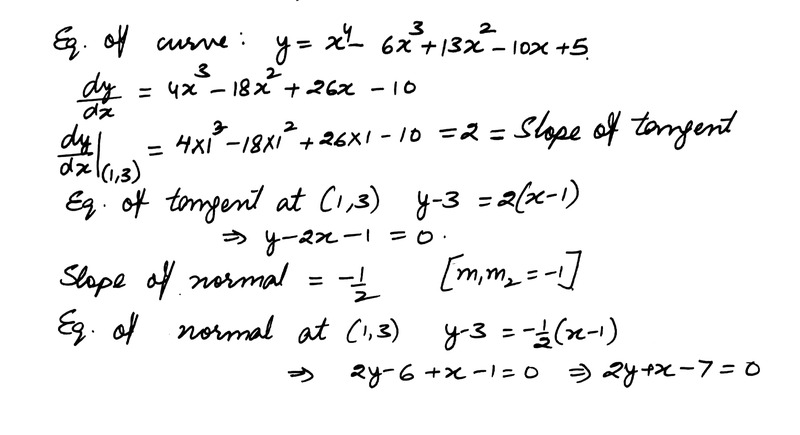 Find the equations of the tangent and the normal to the curve y = x4 - 6x3+13x2 - 10x + 5 at (1,3). Find the points on the curve at which the tangents are. 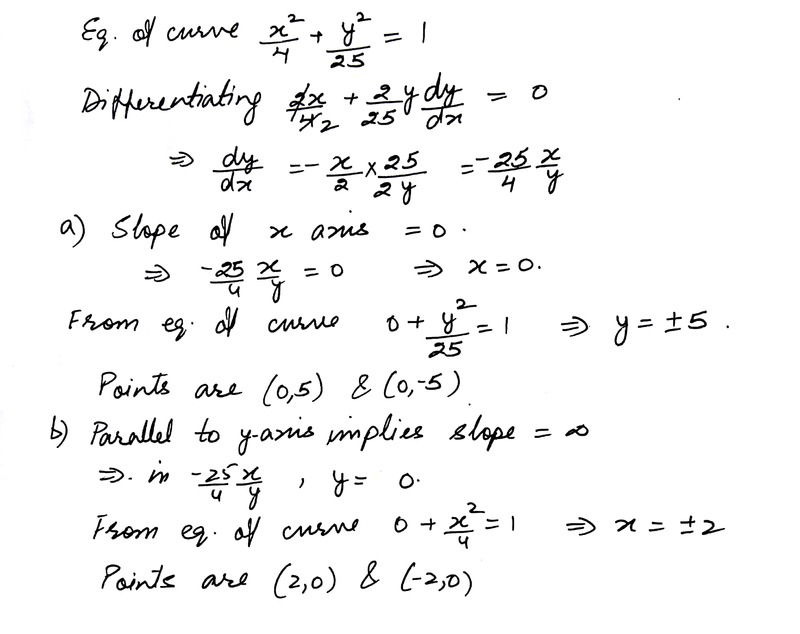 Determine the point of the curve y=3x2-5 at which the tangent is perpendicular to the line whose slope is -1/3. If the tangent to the curve y=x3++ax+b at (1,-6) is parallel to the line 2x-2y+7=0, find a anb b. Show that the tangents to the curve at the points where x=2 and x=-2 are parallel. Find the slopes of the tangents at the three points where the curve cuts the x-axis. p(x)=0.03x3+0.2x2+15x+100 represents the air pollution in an industrial area due to smoke produced by x chimneys. Find the marginal value of air pollution when 3 chimneys are increased. 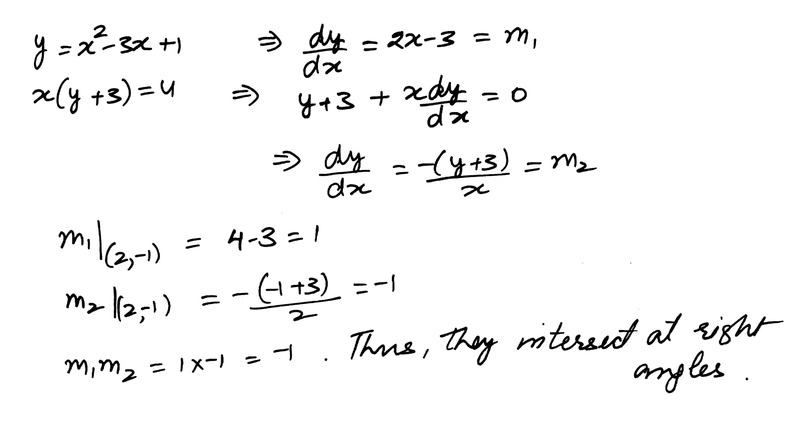 Which value does this question indicate? A conical vessel whose height is 4 meters and the base radius 2 meters is being filled with water at the rate of 0.75 cubic meters per minute. Find the rate at which the level of the water is rising when the depth of water is 1.5 meters. Displaying 46-60 of 195 results.